When David Cameron moved Chris Grayling to the Home affairs slot he wanted a "pub ready"* spokesman on the issue of crime. Although economic issues will dominate the next General Election there are growing fears of a "credit crunch crime wave" as people falling on harder times engage in more "acquisitive crimes". "If you ask most people in this country what they hate most about crime in our society, they’ll tell you it is the smaller offences — the acts of antisocial behaviour that cause misery to communities…"
"…What Bill Bratton realised was that one leads to the other. If you leave minor crime unchecked, then things will deteriorate into something much worse. Yet in today’s Britain the police often don’t have time to deal with the smaller stuff. Too often 999 calls get little response because there are more pressing needs elsewhere. Only a tiny proportion of police time is spent on the beat. So a gang causing trouble will get away with it. And worse will follow." Plenty of Tories have promised zero tolerance policing over the years. 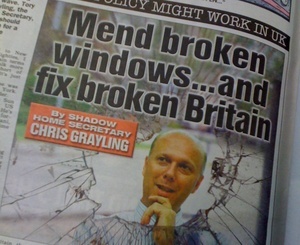 Over the next year we’ll be asking Mr Grayling to show how he’ll get rid of the many barriers in its way.